The headline is a little misleading. It suggests that there are some bank-owned properties that aren't trashed. Well, there are, but not many. The Boston Herald reported April 28, 2008 that many ex-owners of foreclosed properties take lighting fixtures and trash homes on their way out the door. It's absolutely true, and it happens more often than not. It's to the point where I am amazed to see a bank-owned property that isn't in really crappy shape (Herald Photo). "People rip up walls, kick in doors or take bathroom fixtures or copper wiring - sometimes to sell, other times just to get back at lenders." Here's a tip: Don't open any refrigerators left behind. "Figures on vandalized foreclosures are hard to come by, because owners can legally do what they want with homes until lenders seize property titles. Crooks also sometimes hit homes after former occupants have moved out." When I hear about investor wannabes buying foreclosed property at auctions without seeing the inside I cringe. Nearly 1,200 homes in Massachusetts were seized last month by lenders, up about 140 percent from March 2007, The Boston Globe reported April 25, 2008. The data comes from The Warren Group, a publisher of real estate data. "Foreclosures during the first three months of the year topped 2,800, also up about 140 percent over the same period last year. Massachusetts is on pace to shatter the previous record for the most foreclosures in a year, set in 1992." The foreclosures are most common in urban areas and with multi-family properties. "In Lawrence, at the current pace, 4 percent of the city's residential properties will be seized by lenders this year." Although many of the multi-family foreclosed properties remain on the market many months, investors appear to be buying single-family foreclosures much more quickly. In fact, my experience has been that many bank-owned, single-family properties receive multiple offers. Many people believe the foreclosure crisis will worsen before it improves. "There are indications that worse is yet to come: The number of petitions to foreclose, an indicator of future foreclosures, climbed by 33 percent to 2,918 in March, compared with 2,189 filed in March 2007." What many potential home buyers don't realize (or simply don't want to believe) is that the foreclosure situation is different from community to community. Not every city or town has been affected by foreclosures. "The problem continues to plague some communities more than others. 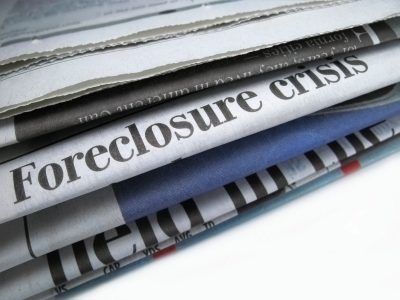 Ninety-five Massachusetts cities and towns have yet to record a foreclosure this year. Brookline is the largest town on that list, followed by Lexington. By contrast, the cities hit hardest, including Lawrence and Brockton, are amassing foreclosures twice as fast as last year." Based on its population, Boston hasn't had that many foreclosures. Dorchester has had more than the rest of the city combined. A housing relief bill being considered in the United States Senate would provide Massachusetts with $211 million to boost home ownership and help homeowners avoid foreclosure, the Boston Herald reported April 3, 2008. "The money is part of a $10 billion mortgage revenue bond program for state and local housing agencies that Sens. John Kerry, D-Mass., and Gordon Smith, R-Ore., pushed to include in the bill." Kerry, who is running for re-election in November, said the Federal Reserve recently moved quickly to assist investment bank Bear Stearns as it stood on the brink of bankruptcy. He said the same urgency was needed to help families struggling with the foreclosure crisis. "The new bond program could mean 1,110 new and refinanced home loans in Massachusetts, and up to 80,000 new loans nationwide, Kerry said." 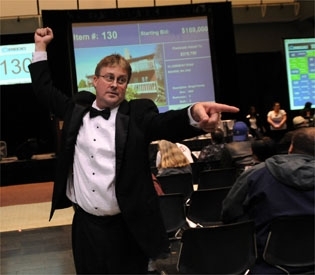 About 170 foreclosed Massachusetts properties were up for sale at an Auction at the Hynes Convention Center March 29, 2008, the Boston Herald reported. Real Estate Disposition Corp, an Irvine, Calif.-based company, held the auction, but is under investigation by state officials for allegedly selling some houses at a November 2007 auction before the foreclosure process was completed, according to the Boston Herald. I'd be a little nervous when the people working the auction are wearing tuxedos (Herald photo). 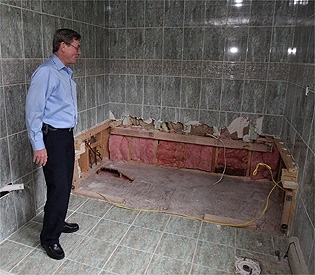 After all, these are properties with leaky roofs, filthy carpets and wet basements. Massachusetts foreclosure petitions continued to rise in February, especially foreclosure petitions involving multi-family homes, the Boston Herald reported March 31, 2008. The Warren Group, a Boston-based publisher of real estate data, reported that Bay State foreclosure petitions totaled more than 2,200 in February, up 27 percent from the same month a year earlier. Foreclosure petitions are a first step that often leads to owners losing their homes. Foreclosure deeds, in which the owner loses the home, more than doubled to 860 in February. "A disproportionate number of February foreclosure petitions involved two- and three-family homes. The 635 petitions for multifamily homes represented 23 percent of all petitions, but multifamily homes make up 11 percent of the state’s housing stock."